Insightus is a North-Carolina-based organization passionate about many things, including voter protection. They wanted a tool to allow North Carolina citizens to keep an eye on their voter registration records, looking for changes or removals. Changes obviously aren't always bad - sometimes you move or change your name, and you really do want the record to change. But knowing that your record changed is always good. Ragtag volunteers built out the back-end for their project at https://ncgovote.org/. 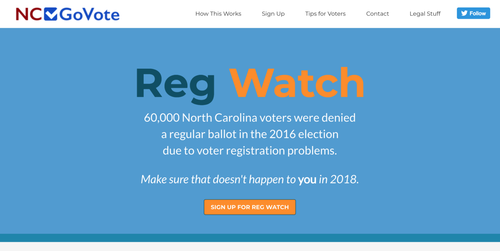 In its first month of operation alone, Reg Watch detected adverse changes in nearly 1% of enrolled users' voter registration records, and alerted them. Check out the Medium post about this project here.